After growing up on his parents’ melon farm in southeastern Colorado, Gibson went to college to study art, but had to drop out for lack of funds. In 1939, he submitted an art test by mail and was hired by Walt Disney Studios — at $16 per week. He had to borrow money to get to California. He worked as an animator, including on the Disney films Fantasia (1940), Song of the South (1946), Alice in Wonderland (1951), Lady and the Tramp (1955), and 101 Dalmatians (1961). Meanwhile, he went back to art school on the side, and sculpted faces as a hobby. Walt Disney himself saw the sculptures, and in 1954 asked Gibson to work on a new project for the company: Disneyland. There, he sculpted busts of every U.S. president for The Hall of Presidents, and created the original “animatronic” figure of President Abraham Lincoln for the 1964 World’s Fair; the figure was moved to Disneyland in 1965, for the “Great Moments with Mr. Lincoln” attraction. 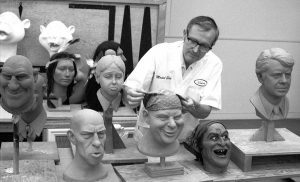 Gibson also created most of the figures for the Pirates of the Carribean, Haunted Mansion, Enchanted Tiki Room, and It’s a Small World. When he was working on a figure for the studio, he once said, business office staff would sometimes stop in and ask how much it would cost. He would “look at them blankly, come up with a figure, and lie.” To get inspiration, Gibson would watch people in public settings. “My mother would kick him under the table to get him to stop staring,” says his son, Wes. “It would even happen in church. You would see him looking and you knew he was thinking, ‘That would make a good pirate.’” Gibson retired from Disney in 1983, but kept going back to make more busts for the Hall of Presidents as new presidents were elected — through George W. Bush. Gibson died at his southern California home on July 5. He was 97.